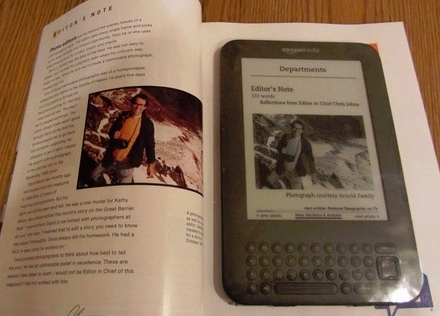 I’ve been surprised how many new magazines have suddenly come out with Kindle editions. This spring I noticed the arrival of National Geographic magazine, which you can read on your Kindle for just $1.99 a month. And it’s one of several new magazines sporting a new feature — the ability to read the magazine with color images using a Kindle app on an Android tablet or smartphone! It’s a sign that Amazon may be striking deals to make color magazine content available for the (still-rumored) release of a color tablet-sized device. 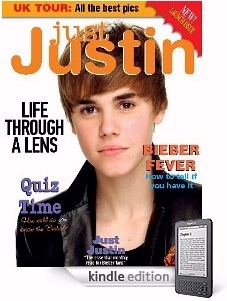 There’s several other magazines in the Kindle store which are now also listed as available on Android devices. Science News — delivered every two weeks — has lavish color images (along with tantalizing tidbits of news). Smithsonian Magazine — delivered monthly — is published by the famous Washington D.C.-based museum, and supplements its exhibits by covering “the arts, environment, sciences and popular culture” (according to its description at Amazon.com). All three of these magazines are available for around $2.00 — and you don’t even have to sign up for a subscription. Each one offers a 14-day free trial — but you can also purchase a single issue. 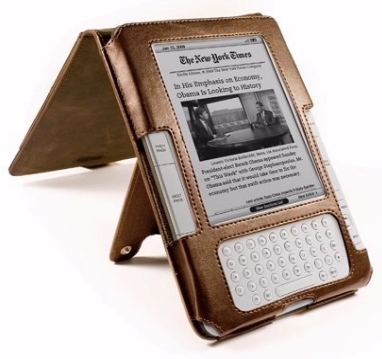 It’s easy to forget about magazine subscriptions when you’re busy reading e-books on your Kindle. But here’s a list of some of the new and interesting magazines that are now available on the Kindle. E-books are rocking the publishing industry, so they’re a constant presence in Publisher’s Weekly. (The magazine describes itself as “the definitive professional resource covering every aspect of book publishing and book selling.”) It’s a must-read for people in the industry, and for more than 100 years the magazine has compiled an annual list of the best-selling books. It was a bellwether moment when this year, for the first time ever, Publisher’s Weekly began including e-books in theri calculations. A monthly subscription on your Kindle costs $19.99 — though of course, it’s delivered ever week. And who knows? Maybe soon you’ll be able to read these magazines on a new Amazon tablet!